I've been deliberating writing this post for a while now, not least because the vast majority of the products I've used and loved over the last 12 months aren't particularly exciting or revolutionary. 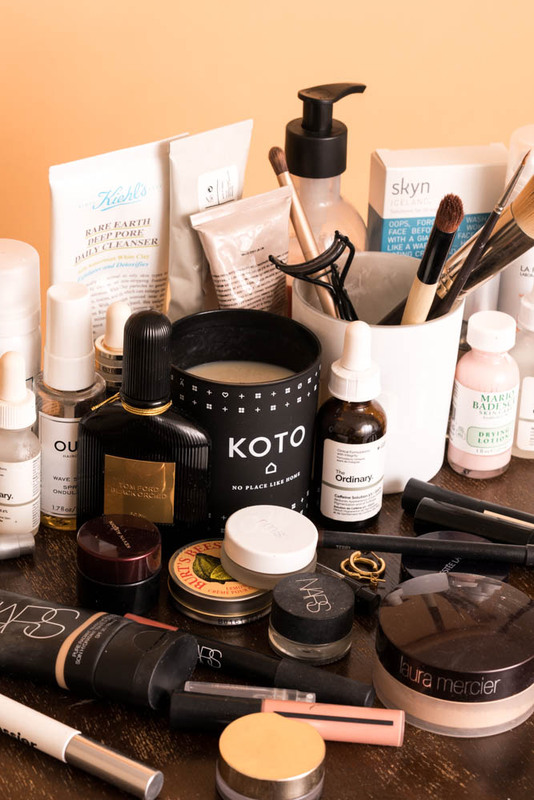 Almost every part of my beauty routine - if you can even call it that anymore - has been stripped back to the bare necessities, as I make a conscious effort to stop overspending on products that don't really work for me and focus on the ones that do. My most-used products of 2017 therefore consist mainly of those that might not look the best on my bathroom shelf, but do just the jobs that I need them to. My love affair with Burt’s Bees has been something of a slow burner, having tried a handful of products in the past but never fully committing to the whole range. As I’m getting older, I’m finding myself caring less about the brand name associated with the products I use, and more about their quality and effectiveness. Humble packaging and price tag aside, Burt’s Bees is the brand that has stood front and centre in my bathroom cabinet this year. Their Coconut Foot Cream is a god send for anyone who struggles to find something rich enough to tackle even the driest areas, and the Milk and Honey Body Lotion is a comforting choice that leaves skin feeling soft and supple for as long as I need it to. Various flavours of the classic Natural Lip Balms can be found scattered across the flat and in various handbags, while I never leave home without one of their tinted balm offerings (Rose and Hibiscus are current favourites). There was a time that I was recommended NARS’ Tinted Moisturiser on an almost daily basis, yet my reluctance to give up on more heavy coverage base products prevented me from giving it a go. I still struggle with my skin from time to time, but even on bad days this has been practically all that I’ve used this year (honestly - aside from the very rare formal occasion for which only Estée Lauder Double Wear will do the job, 99% of the time this has been it). I’ve taken to applying this with fingers, massaging it across the skin the same as I do any other, un-tinted formula. I find that it leaves a fresh, radiant glow on the skin - especially when paired with other creme products - yet it gives me just the soft veil of coverage that I need. Not one for lovers of camouflaging every inch of skin, but certainly worth the high praise it receives within the industry. I’m a big fan of using salicylic acid to calm spots and blemishes the moment they arrive. Skyn’s Blemish Dots are transparent stickers that can be applied directly to cleansed skin, and are packed with anti-bacterial, detoxifying goodness - including the aforementioned salicylic acid, grape seed extract and tea tree oil. I’m still yet to find a blemish treatment that performs miracles, but if I can apply one of these to the source of the problem early enough I have found them to dramatically decrease the size, redness and staying power of spots and blemishes. 2017 was the year I finally opened my heart to haircare outside of Bumble and Bumble. Well, not entirely. Bb’s Don’t Blow It Air Styler will always be one of my holy grail products, and I’m still an avid fan of Brilliantine. OUAI’s Wave Spray has become a staple of my routine however, knocking my beloved Surf Spray off the top spot for the first time in years. While I can’t quite get used to the feeling of applying mousse to dry hair, their Dry Shampoo Foam is well worth a mention too. Make it past the jarring, sticky stage and the result is refreshed hair with tons of added volume. Glossier’s eyebrow filler isn’t for everybody, and I completely understand why. The final result is natural and minimal, yet for anybody who embraces a more paired back look it comes highly recommended. I use the shade Brown, gently brushing the formula up and across my brows to add fullness, definition and just a little bit of colour. Unlike similar products I’ve tried from Benefit and Charlotte Tilbury, it also feels completely undetectable, somehow managing to keep individual hairs in place without stiffness or clumping. My eyebrows are significantly less high maintenance than they were a few years ago, so I relish being able to rely on one fuss-free product each morning. Another brand that I hadn’t paid close enough attention to prior to 2017, Yes to... products - from shampoo to face masks - have gradually been filling up my bathroom cabinet over the past 12 months. I’m extremely cautious about trying new things on my skin, yet the Yes to... Tomatoes range seems to work really well for me, with the Detoxifying Powder-to-Clay Mask singlehandedly saving my skin from a chocolate-induced breakout over Christmas. With a high quantity of natural ingredients, a firm stance against animal testing and a great selection of vegan products, it's a cheap and cheerful range that delivers in terms quality and brand ethics.